Moviegoers attending the Stony Brook Film Festival this month are also in for a second visual treat. 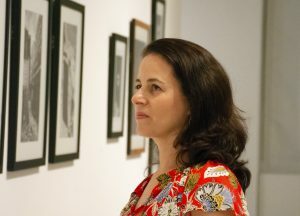 The Faces and Places: Photographs from the Kellerman Family exhibit at the Paul W. Zuccaire Gallery in the Staller Center runs parallel to the 10-day independent film festival, so attendees can visit while on campus. The collection consists of more than 60 still photographs — in black and white and color — taken by 10 internationally renowned photographers including Walter Iooss, Kristin Capp, Ralph Gibson, and James Nachtwey. Iooss’ work features sports stars at rest and in action while Capp’s focuses on the humanity of people from around the world. “I felt that these were very strong works by some really well-known fine art and documentary photographers,” said Karen Levitov, curator and director of the Zuccaire Gallery. “I’m really compelled by the work of Kristin Capp, who is a photojournalist. She has gone to Brazil and many other places around the world, capturing the people and the places in different areas.” Levitov added that there were a number of other photographers whose work inspires viewers to consider different cultures worldwide. The gallery is open and admission is free during the film festival from July 19 to 28 and August 27 to September 29. Filmgoers may find the art experience both convenient and informative. One visitor said the art gave her a new perspective on the modern world. After the exhibit closes in September, the photographs will find their way to many departments across campus for wider viewing. The photos were donated to Stony Brook University by alumna Katherine King Kellerman, whose family collected them over many years. The Kellerman family was motivated by the thought that the pieces could be enjoyed by a much broader audience, Levitov said, adding that the artwork will be distributed throughout the campus.